Located at the Arthur Cenotaph and Monument Park, it recognizes the service of all veterans and soldiers who have, and who are, protecting our freedom. 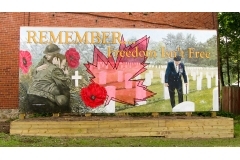 Many community members and groups are recognized for their involvement in the mural project, including: the muralist, Cliff Smith, the Royal Canadian Legion Branch 226 in Arthur, the Arthur and Area Historical Society, the Township of Wellington North, and all the dedicated volunteers. Inspired by two Wellington North residents- a grade 12 drawing project by Steve Cherry, finalized by muralist, Cliff Smith, the mural is a great example of a community coming together with private and public funds, with materials and labour all being offered to see the project done. The overall community involvement in this project underscores how a cultural project enlivens people, resulting in benefits such as maintaining and nurturing a pride of ownership in our community. The Cenotaph erected in Arthur to honour the soldiers who fought in World War 1, World War II, and in peacekeeping missions. Arthur and Area Historical Society preserves artifacts and documents of local and general interest. The Society is active in projects of many kinds throughout the community.